In this audio interview, Bengali writer NABANEETA DEV SEN envisions a natural falling away of patriarchy and the wisdom of Indian women becoming harnessed for the future through education. Dev Sen visited Scotland during the 2007 Edinburgh Festival `nd participated in a series of readings that led to thought-provoking exchanges of ideas. 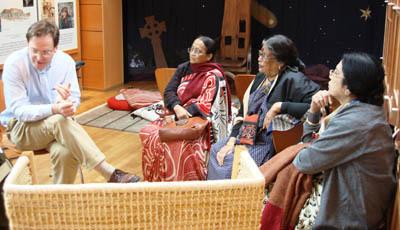 The photograph shows her flanked by Selina Hossain and Bani Basu, in conversation with Donald Smith at the Storytelling Centre in John Knox House, Edinburgh.